The O’Reilly Data Show Podcast: Erich Nachbar on testing and deploying open source, distributed computing components. When I first hear of a new open source project that might help me solve a problem, the first thing I do is ask around to see if any of my friends have tested it. Sometimes, however, the early descriptions sound so promising that I just jump right in and try it myself — and in a few cases, I transition immediately (this was certainly the case for Spark). I recently had a conversation with Erich Nachbar, founder and CTO of Virtual Power Systems, and one of the earliest adopters of Spark. In the early days of Spark, Nachbar was CTO of Quantifind, a startup often cited by the creators of Spark as one of the first “production deployments.” On the latest episode of the O’Reilly Data Show Podcast, we talk about the ease with which Nachbar integrates new open source components into existing infrastructure, his contributions to Mesos, and his new “software-defined power distribution” startup. “I have sort of my mini test suite…If it’s a data store, I would just essentially hook it up to something that’s readily available, some feed like a Twitter fire hose, and then just let it be bombarded with data, and by now, it’s my simple benchmark to know what is acceptable and what isn’t for the machine…I think if more people, instead of reading papers and paying people to tell them how good or bad things are, would actually set aside a day and try it, I think they would learn a lot more about the system than just reading about it and theorizing about the system. For example, with Spark — we had an iterative processing that we did for Quantifind. If we had to spill to disk, run the usual MapReduce, it would have been probably 50 times slower because there is disk involved versus just keeping it in RAM and reprocessing it. I do try to look at what I see out there, and then if I see Spark can actually give us an edge, because I can’t buy 100 times more machines for this particular product feature, I switch to Spark and I can buy a little more RAM. That is a great trade-off to implementing product features that other people couldn’t, or would need to spend a lot more money for. “Pretty much everyone has accepted virtualization for compute…For most people, it sounds a bit counter-intuitive because it’s power and it’s, really, electricity, and you can’t really control it that easily. But the same principles apply also for software-defined power. The basic idea is that, instead of statically allocating power, which is the equivalent of buying a server that runs exactly from that location, you could really have software that essentially analyzes where power is needed — it will say, ‘Historically, this equipment has never used more than X kilowatts, and if the equipment actually uses more, we will be able to step in with lithium batteries and essentially flatten peaks. 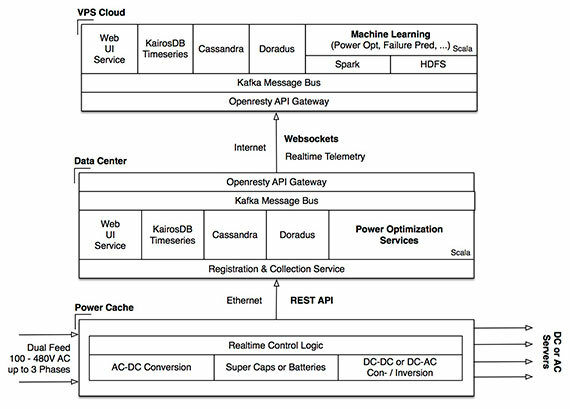 Virtual Power Systems: data flow and platform. Source: Erich Nachbar, used with permission.